North America has been hit by three major earthquakes within the last 24 hours. A magnitude 6.2 earthquake struck just off the coast of Oregon early on Wednesday, and that was followed by a magnitude 5.3 earthquake in Ometepec, Mexico that was so powerful that it was felt all the way in Mexico City. And just a few hours ago, an enormous magnitude 6.3 earthquake hit Alaska. The “Ring of Fire” has awakened, but up until the last 24 hours North America had largely been spared. Something truly unusual appears to be happening to our planet, and many are deeply concerned that this rise in seismic activity could be building up to a major event. Yesterday I reported that 144 major earthquakes had occurred over the last 7 days, but now that number has risen even higher. I just checked, and the USGS says that the number of major earthquakes over the past 7 days has now risen to 157. In case you were wondering, that is not normal. Now that the west coast has been hit, the mainstream media is finally starting to take notice of all the shaking that has been going on, and some outlets are even breathlessly proclaiming that “the Big One” could soon hit California. The quake, which registered 188 miles from the coastal city of Bandon, has sparked fears the so-called “Big One” could hit near California. 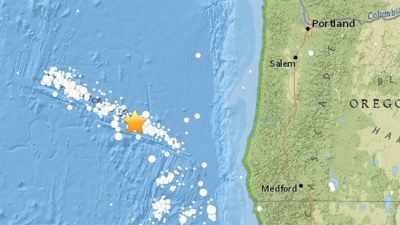 Just a few weeks ago, two earthquake swarms hit the Cascadia Subduction Zone in less than a week. So the fact that this latest earthquake hit the exact same area is definitely raising concerns about what may happen next. It last struck in 1700, when it sunk the stretch by as much as 20 metres, tjhough there are no written records of the natural disaster. The death toll from that magnitude-9 quake is unclear but it is understood to have unleashed a tsunami which travelled 5,000 miles across the Pacific to Japan. We are talking about the potential for a natural disaster that is unlike anything that we have ever seen in American history by a very wide margin. Scientists have predicted the ‘Big One’ could trigger a tsunami of 85ft high waves and could potentially drown as many as 33,000 people on the West Coast. More than 160 experts have since 2013 gathered to develop the Oregon Resilience Plan. If the Big One is to happen soon it can devastate and affect the regional and national economy. Do you remember the giant tsunami in the movie San Andreas? Well, the truth is that what we are potentially facing is even worse than that. Colin Taylor, professor of earthquake engineering at the University of Bristol, told Standard.co.uk: “The majority of earthquakes around the world are driven by plate tectonics over the earth’s crust. They occur when quakes move past, or under, each other. Every now and again, they reach the limit of their strength and break, emitting energy. According to the NOAA, 39 percent of all Americans live in counties that are directly on the shoreline. To say that we are extremely vulnerable to tsunamis is a major understatement. The experts tell us that a “mega-tsunami” can reach speeds in the open ocean of up to 500 miles an hour, and when they reach shore they can produce waves that are several hundred feet high. If a mega-tsunami hit anywhere along the west coast of the United States, it would instantly crash our economy and it would be the deadliest and costliest natural disaster that we have ever seen. So let us hope that “the Big One” does not hit us any time soon, because when it does strike life in America will immediately and irrevocably change forever.